Winterizing Your Pool is a Snap! Drain your skimmer, not your pool™ to prevent costly freeze damage to skimmer. Recessed lid design prevents shifting ice from removing the lid. Saves metal pool walls from corrosion year round. Guaranteed not to leak! UV and chemical-resistant, good to minus 80° F below zero. The SKIMSAVER™ LID'L SEAL™ fits the most popular standard and widemouth above ground and in ground skimmers. 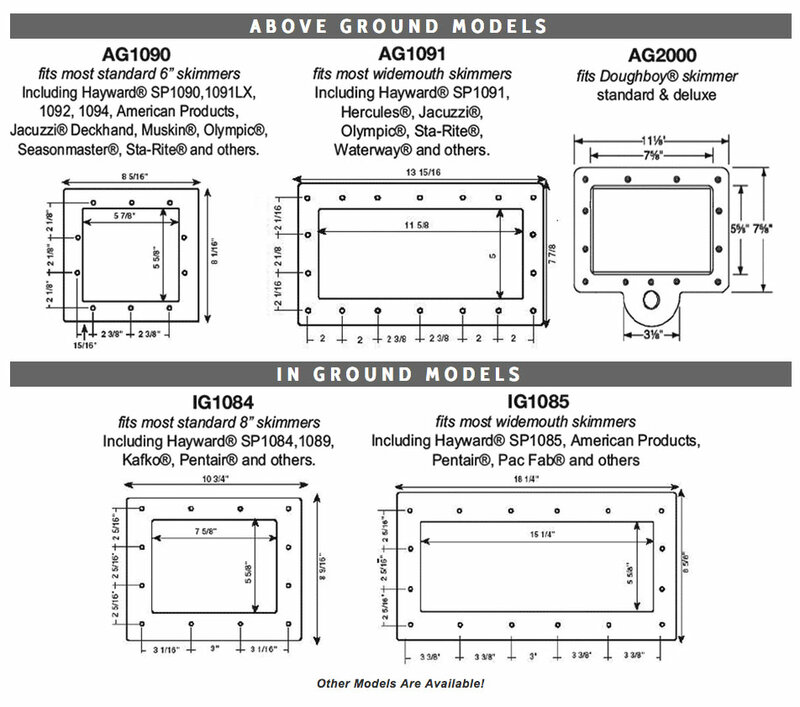 To determine which model will fit the existing skimmer, measure the bolt pattern of the faceplate and compare to the templates below. The bolt pattern of the Lid' L Seal™ should match the bolt pattern of the existing skimmer exactly; the interior or exterior dimensions may differ slightly. 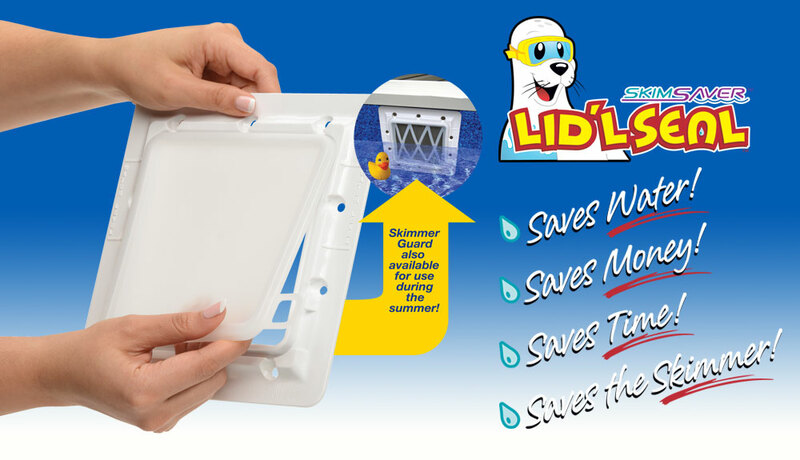 NOTE: Skimmer gaskets DO NOT come with the SkimSaver™ LID'L SEAL™. On new pool installations simply install the new gaskets that came with your skimmer. ON existing pools it is highly recommended that you replace your skimmer gaskets when installing LID'L SEAL™. *If gaskets are torn or show any wear they MUST be replaced. New Pools: LID'L SEAL™ should be installed prior to completely filling your pool with water. Existing Pools: Drain pool water just below the skimmer's opening, 1"-2". Assemble required items. 1. Remove existing skimmer faceplate using a #3 Phillips head screwdriver. Keep the screws; you will be using them to reinstall your SkimSaver™ mounting plate. 2. Inspect gaskets and replace if necessary. See above recommendations. 3. Align gaskets and new SkimSaver™ mounting plate against skimmer opening and reinstall existing screws. Hand-tighten using a #3 Phillips head screwdriver. 4. Apply a thin bead of Magic Lube® along the inside lip of the flexible lid to ensure a water tight seal. 5. Now when you are ready to seal off your skimmer - simply snap on the LID'L SEAL™ pressing firmly around the entire perimeter for a positive seal. No need to drain your water again! In the future, LID'L SEAL™ will simply snap on and peel off. The SkimSaver™ mounting plate will remain permanently installed on your skimmer. Use the LID'L GUARD™ during the swim season.